Stand up bikes are our latest innovation. Enjoy the familiar bicycle pedal stroke without the neck, back and seat pain. SUBs are ready to take you everywhere, including off-road. Fitness and fun have arrived in our sleek new Stand Up Bike. Responsive, light and portable, this bike is ready to go wherever you GO. The Mountain Stand Up Bike takes stand up cyclists where they’ve never gone before: off-road. From dirt trails to urban landscapes, this cardio-chameleon allows riders of all levels to customize where they GO. Featuring a hybrid elliptical pedal stroke, the compact-stride bike is ideal for the fitness enthusiast looking to target a variety of muscle groups. Get a time-efficient, full-body workout without the impact. Our most affordable model, the ElliptiGO Arc 3 delivers an invigorating workout that’s ideal for short- to medium-length rides on flat or gently rolling terrain. With its combination of quality and performance at a great price, the ElliptiGO Arc 8 quickly became the top-selling stand-up bike in the world. Ideal for cruising, sprinting or climbing moderate hills. The ElliptiGO Arc 24, our high-performance compact-stride model, comes fully loaded with extra comfort and performance features, plus the widest gear range of any elliptical bike. Ideal for any riding style and terrain. 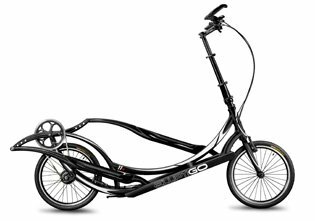 Featuring a smooth, elliptical motion, the long-stride bike is a favorite among runners and fitness enthusiasts alike. Enjoy comfort, performance and indoor/outdoor versatility on our award-winning bike. The perfect way to enjoy outdoor exercise - easy to ride, easy on the body and just plain FUN! Great for flat roads or mild hills. Most popular model delivers the perfect blend of cost vs. performance. Can climb any hill a road bike can climb. Fun, comfortable, and easy to ride while delivering an incredible workout. Designed specifically for racing and ultra-endurance events, with carbon-fiber drive arms and 11 speeds, it's the lightest and most capable elliptical cycle in the world. Stand up and GO! ElliptiGO bikes give you a fun and innovative way to exercise outdoors. With both elliptical and traditional pedal motions, you’ll enjoy a comfortable, stand up riding position, a hyper-efficient workout, and boundless fun. Young or old, runner or cyclist, health conscious or competitor, you’ll be achieving your goals and seeing results. Get the latest product information, find cool rides and learn helpful tips for keeping both you and your ElliptiGO® bike in top shape. Sign up for our newsletter today!